Insect economic thresholds represent the break-even point for an insecticide spray. If insect counts are at the threshold, yield benefit from an insecticide spray will be enough to cover the product and application cost of the spray — that’s it. When insect numbers rise above the threshold, there will be a return on investment. Thresholds are adjusted based on value of the crop, and total cost of the application. Lygus and bertha armyworm thresholds are based on research that measured how much yield loss can be attributed to each single insect. 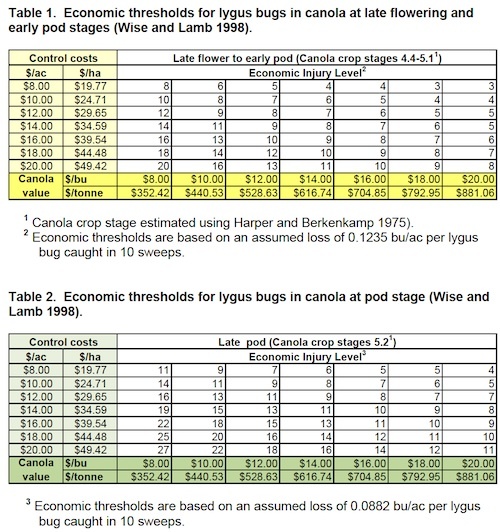 From there, extension entomologists created tables with specific threshold numbers based on control cost and canola value. Thresholds used to manage all other insects in canola are “nominal” thresholds, based on experience but not research to quantify the impact of the insects on the crop. Bertha armyworm: Bertha thresholds are based on work by Bracken and Bucher, published in the Journal of Economic Entomology in 1977. They found that each bertha armyworm larvae per square metre can cause a 0.058 bushel/acre loss. The thresholds table (at the bottom of the article) is based on how many bertha armyworms can be present per square metre before a spray becomes economical, adjusted for spray cost and canola price. 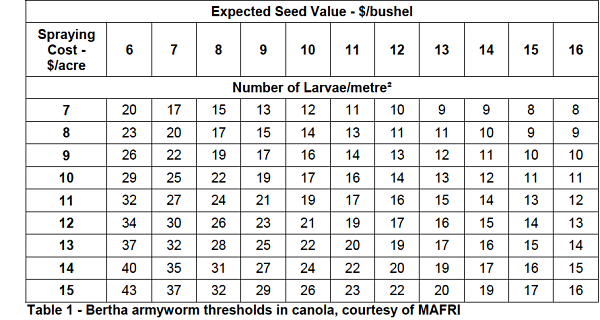 For example, if canola is $12 per bushel and spray costs $8 per acre, the threshold is 11 larvae per square metre. Check where bertha armyworm are feeding on the plants before spraying. Once bertha numbers are at or over the economic threshold, spray as soon as they start feeding on pods. Click here for scouting tips. Lygus: Thresholds are based on research by Wise and Lamb in Manitoba, published in Canadian Entomologist in 1998. They found that one lygus can cause a 0.1235 bushel/acre loss at the late flowering to early pod stages and 0.0882 bushel/acre loss at the late pod stage — when seeds in the lower pods are green. At later stages of canola, insecticide applications would not be economical. Threshold tables at the bottom of this article are based on lygus adults and late instar nymphs (the ones with the black dots) per 10 sweep-net sweeps. Thresholds vary based on cost of application and the price of canola. To give one example, if canola is worth $12 per bushel and spray costs $8 per acre, the threshold at the late pod stage is 7 per 10 sweeps. These numbers are still valid…but only when the crop is under moisture stress. This research found no economic response to insecticide when rain events occurred during early podset. Further, new work performed at AAFC reinforced the amount of damage each bug can do under drought conditions. Hector Carcamo, who led this research at AAFC Lethbridge, does not advise insecticide applications when lygus numbers are below 50/10 sweeps when growing conditions are “good”.Click here for scouting tips. Cutworms: Nominal thresholds for canola are based on 25% to 30% stand reduction. With a stand reduction of less than 25%, canola plants may be able to branch out and compensate for some of the damaged or killed plants. However, if bare patches are developing as a result of cutworm feeding, spray around the border of these patches to limit their size, as the complete lack of plants does not allow for any compensation to occur. Scouting is required to make sure stand reduction is actually caused by cutworms, and not wireworms (not controllable), gophers, seedling disease or environmental factors. Click here for more on cutworm identification and management. Diamondback moth larvae: Thresholds are 100-150 larvae per square metre in immature to flowering plants or 200 to 300 larvae per square metre in plants with flowers and pods. However, these are based on dense stands of 150-200 plants per square metre. Reduce thresholds for thinner stands. Early season thresholds, for very early larval feeding, are the same as flea beetles: 25% or more of the leaf area lost, with the larvae present and actively feeding on newest leaves. Cabbage seedpod weevil: Begin sweep netting when the crop enters the bud stage and continue through the flowering period. The economic threshold is 25 to 40 weevils in 10 sweeps. The higher the price of canola, the lower the threshold. Anything below 20 per 10 sweeps and the canola plant will generally compensate for seedpod weevil damage to the buds and flowers. Application, if necessary, should occur at 10-20% flower. More on CSPW scouting and spray timing. Flea beetles: Be ready to spray if 25% or more of the seedling leaf area has been eaten, on average. Canola plants can generally maintain full yield potential if less than 25% of the leaf area is removed. The point at which foliar insecticide provides an economic benefit is when damage reaches 50%, but feeding can reach this stage fairly quickly when flea beetle numbers are high and damage is already at 25%. Spray only if flea beetles are still actively feeding. Click here for defoliation pictures and more on flea beetle management. What if you have multiple insects? Many canola fields have a combination of insects feeding on the crop. An “additive” effect is possible when more than one species are feeding on key yield-producing areas — flowers, buds or pods — at the same time. For example, if pod feeders such as lygus and cabbage seedpod weevil are in the same field and both at 50% or more of their economic spray thresholds, spraying may provide an economic benefit. 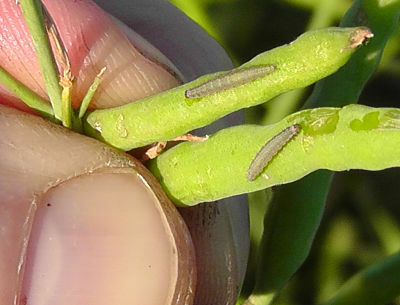 Bertha armyworm and zebra caterpillar are also pod feeders, but they will also feed on other parts of the plant. If they are moving up to pods, then include them in the count. What are the weaknesses in thresholds? Sweep netting. Thresholds for lygus and cabbage seedpod weevil are based on sweep net counts. However, sweep net counts can be highly variable depending on technique. Some training on how to sweep net properly is valuable. —Take a minimum of 100 sweeps in each field. Select 10 spots and do 10 walking sweeps (180° arc) at each spot. Sweep through the top part of the plant — buds, flowers and pods. —Use a standard insect sweep-net (38 cm diameter). —Sample several locations in the field. Walking fields at podding stage is hard work but you don’t have to walk through the middle of the field. —Samples can be collected near the edges since research observed no significant differences in lygus abundance in the edge versus the middle of a canola field. —Sweep when conditions are pleasant (e.g., sunny, low wind, above 15°C and between 10 a.m. and 6 p.m.) to ensure lygus are active within the canopy. Make sure the canopy is dry before you sweep. Canola genetic advances. Canola plants are bigger and hardier than when thresholds were developed. Current hybrids may be able to compensate for more lygus feeding. Growing conditions. Canola is really good at compensating for lost leaf area, buds and flowers. Under good growing conditions, thresholds perhaps could be higher. Under poor growing condition with stressed plants and thin stands, thresholds may need to be reduced. What size of larvae to include in counts? 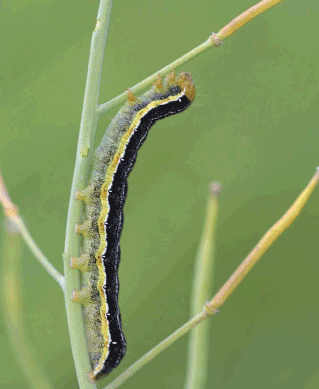 The basic tip when counting bertha armyworm larvae, for example, is to include all worms larger than half an inch long. Smaller larvae may succumb to natural predators or diseases prior to contributing to significant feeding damage. However, if significant numbers of smaller larvae are observed, revisit the field regularly to monitor populations. How many counts to do, and where? The more counts the better, but do at least 5 preferably 10 from various spots within the field. Follow a “W” pattern and sample at each point in the “W” and again between each point. Thresholds are only one factor in the spray decision. Even if numbers are above the thresholds, the decision to spray also depends on what those insects are doing. If they are slowing down and no longer feeding, they may be infected by disease or parasitic (beneficial) insect larvae, or they maybe close to pupation and won’t need to be sprayed. Or, if growers are noticing extensive crop damage (leaf loss thresholds, missing buds, etc.) but insects are gone or at low levels, the damaging population may have come and gone. Control may have paid off a week or two earlier in these cases, but insecticide applied now doesn’t heal the damage that’s already there. 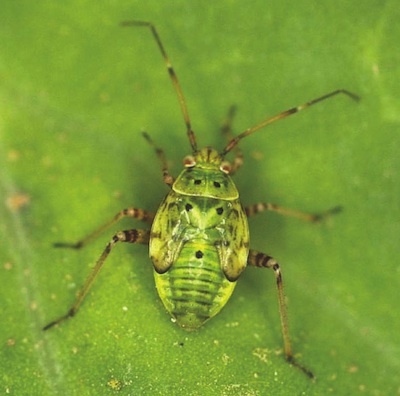 Beneficial insects and other organisms can reduce a pest population before the pest has a chance to cause economic loss, often eliminating the need to spray. We encourage growers to spray once a population has exceeded its economic threshold, but consider beneficials as an asset when making spray decisions. Here are some risk assessment factors that can help to keep beneficials working for you. —Insecticides are best used to protect the plant’s most valuable parts — the pods. Canola can compensate for loss of leaf area and flowers. Applying insecticides only when yield is threatened will preserve profits and beneficials. Spraying early arriving diamondback moth larvae is one example where action may be unnecessary. Unless seedling defoliation is 25% and getting worse, an early spray is not warranted. By leaving them be, you save the spray application for when it’s really needed and you may find, in the case of early-arriving diamondback moth larvae that changing weather conditions and beneficial insects can prevent subsequent generations from causing economic loss. This happened in 2011 and 2012. —Presence of a baseline insect population is good for long term management. A small population of pest species are needed to attract and maintain the beneficial population. Keeping a balance of species can prevent population explosions, and can reduce the need for pesticide applications. Spraying wipes the slate clean, and in some cases, beneficials — especially ground beetles —take longer to build back up than the pest species. There can be a treadmill aspect to insecticide. Once you start, you need to continue just to keep up, because the natural controls have been removed. —Spraying insects below thresholds is not economical on its own terms, and has the added potential cost of reducing pollinator populations in the field, which can reduce yield. Click here for more on bees and canola. — A complex of beneficial organisms keep bertha armyworm populations in check. This complex includes the wasp Banchus flavescens, where the level of parasitized bertha armyworm larvae in some studies has exceeded 40%, a tachinid fly, Athrycia cineria, which may kill over 20% of larvae, and bacteria and fungal diseases. Bertha armyworm cycles end when one or a combination of these beneficials takes down the population. However, the bertha population needs to reach a critical level to allow these beneficials to build as well. Growers don’t want to let bertha wipe out a crop, but at the same time, by spraying before thresholds are reached, growers may prevent these natural enemies from doing their job.